Microcontroller is the advanced version of microprocessors. It contain on chip central processing unit (CPU), Read only memory (ROM), Random access memory (RAM), input/output unit, interrupts controller etc. Therefore a microcontroller is used for high speed signal processing operation inside an embedded system. It acts as major component used in designing of an embedded system. AVR microcontroller is an electronic chip manufactured by Atmel, which has several advantages over other types of microcontroller. We can understand microcontroller by comparing it with Personal Computer (PC), which has a motherboard inside it. In that motherboard a microprocessor (AMD, Intel chips) is used that provides the intelligence, EEPROM and RAM memories for interfacing to the system like serial ports, display interfaces and disk drivers. A microcontroller has all or most of these features built into a single chip, therefore it doesn?t require a motherboard and any other components. AVR microcontroller comes in different configuration, some designed using surface mounting and some designed using hole mounting. 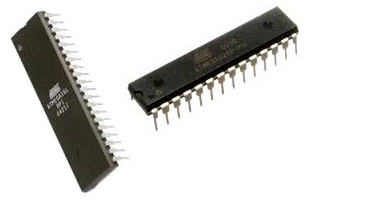 It is available with 8-pins to 100-pins, any microcontroller with 64-pin or over is surface mount only.